Kim's review piqued my interest. Subsequent quotes here and there on Facebook hooked me. 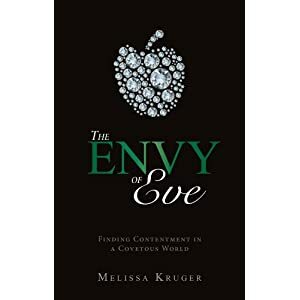 I knew I needed to read The Envy of Eve: Finding Contentment in a Covetous World by Melissa B. Kruger. The multitude of passages highlighted in bright yellow clearly mark just how much. The Year of Peace & Simplicity was born out of my covetousness - my longings to have more, to do more, to be more. Four years later, I finally realized that. "When our desires being because we compare our lives to those around us, and not because of God's work in our life, we can be assured that we are coveting items that will only lead us to cry out for relief from the very items we desired." (pp. 30 -40) Oh! my soul knows that well! As Kruger explains, coveting - money, possessions, love, talents, looks - is rooted in our belief that God isn't sufficient. Do we fear God has forgotten us, or doesn't love us as much as He loves someone else? When we suffer from those insecurities, we are prone to be discontented with our circumstances - and, ultimately, with God. 1. Seek the Lord instead of seeing - develop our spiritual palate by turning away from the things of the world and focusing on time spent with God. It takes time, but it works. 2. Desiring rightly instead of coveting - develop a desire to see God's work done and glory given to Him alone. Meditate on God and His faithfulness, look for ways to encourage others in the faith, consider God's love. 3. Give generously instead of taking - develop a habit of giving time, resources, forgiveness and love. 4. Confess freely instead of hiding - daily confession of our sins to God. This passage (perhaps my favorite) is something I've lived out in the past four years. The Envy of Eve should be required reading for women, even those who would testify that they've never had a covetous thought in their lives (Kruger would convince them otherwise). Thanks to Christian Focus Publications for providing a review copy of this book. With all these positive reviews, I think this book is going on the "to read" list. Thanks, Melissa! Definitely looking forward to this read!